West Ham’s Felipe Anderson scored a late equaliser at John Smith’s Stadium to prevent Huddersfield claiming their second win in six days. Still buoyant from Monday’s victory over Fulham, the Terriers started brightly and Alex Pritchard opened the scoring with just their second goal at home this season – and the first scored by a Huddersfield player. The hosts then lost Chris Lowe to injury as the German midfielder was carried off with a suspected dislocated shoulder and West Ham had the better of the second half. 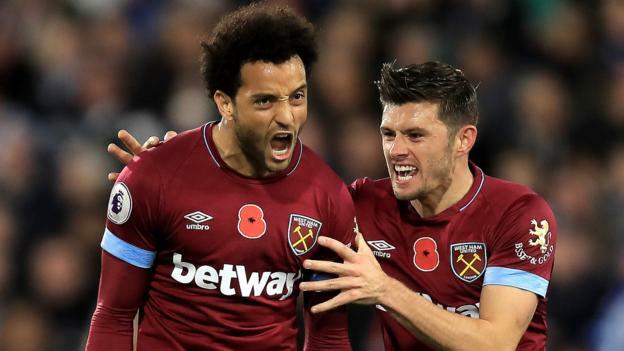 Anderson drew the Hammers level but they were unable to follow up last week’s win over Burnley with another victory and secure back-to-back league wins for the first time since January 2017. A point was enough for Huddersfield to move Cardiff back to third-bottom in the Premier League, while West Ham remain 13th.